Why host a Private Party? You can host a private party in the studio or favorite venue. Private parties have many advantages. You choose the time and location. You choose the project. You choose who will be invited. 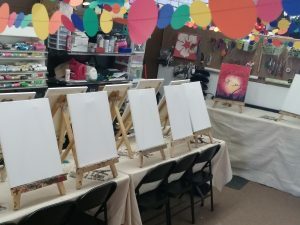 You can paint for free if you have a group. There are lots of great venues available for parties. You can reserve a class for as little as 3 persons or as many as 40. Call or text 575.366.3950 or email me at for questions or to reserve a private class. 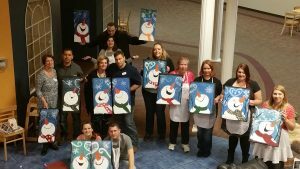 Private parties are $25/person in the studio and $30/person at another location like your home, club, office or restaurant. If your group has 6 or more painters, the host is free! I will come early to set up before your guests arrive. To reserve your party I will need the date and time. Before the party I will need the location, a head count and the painting or project you would like to do. You can view the painting choices on my Pinterest Board. I recommend that the host choose the painting, but if you would like to give your guests an opportunity to choose, you should limit their choice to 2 or 3 paintings. I provide all the supplies including table coverings, aprons, canvases, easels, paints and more. You will need tables and chairs and you will need a water source. Everything will be set up for you when you take advantage of the studio. At the studio, you can also bring in food and beverages or have your event catered. Your guests can even eat while they paint. You cannot bring alcohol into the studio.